Great comforter, I really like it, it's beautiful and warm. The Sardinia Collection offers bright, bold colors in an over-scaled paisley print motif. This comforter brings in bright shades of blue and greens to create this unique design on a soft, 100-percent cotton fabrication. The reverse of the comforter offers a mini-diamond print that perfectly compliments the boldness of the face of the comforter. The comforter features a tackless finish, which offers a clean finish on your comforter without any stitching to distract from the beauty of this comforter. Most of the decorative accents include embroidery details. The Sardinia Euro Sham is in a bright shade of blue with white embroidery detail along all 4 sides of the Euro sham. Dimensions 90.0 In. X 86.0 In. X 1.5 In. I love this comforter. It is very thick and soft. Beautiful colors... Don't try to pull the tags off as my husband did, it will leave a hole. Just renovated master bedroom and took the plunge into COLOR. Not disappointed at all with this comforter set. Colors are beautiful and playful. Shams and extra coordinating pillows really make it a lovely, plush bedroom. Love it. Love this set! The colors are bright and cheerful; true to the image on the website. The comforter is soft. I'd describe it as medium-to-heavy weight, but we've used it year-round. The shams have held up really well. It's been over a year since I bought this set and it's done well being washed in my front loading washing machine. I purchased just the optional shams and they are quite nice. I love this comforter, the quality is amazing! Echo is a great brand, I will say the only thing is that it isn't a true white if you are looking for a pure white. The comforter colors are still beautiful and I never need a blanket, this comforter is heavy and a great quality. Really pretty and vibrant! 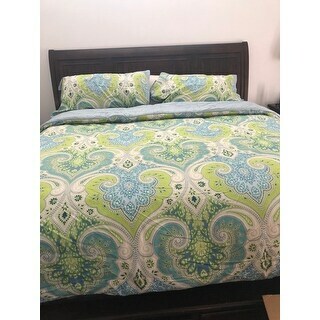 Purchased for my mom and the set is just gorgeous in her bedroom and she loves it. It's early stages, have not cleaned/washed it yet so that will be the real test but it appears to be very nice. Colors were true to was we saw online as well. This comforter is great! I painted our bedroom at the lake house blue with a bright green accent wall and it really shows off the colors in the comforter. Good quality and warm!! This is a beautiful, well made comfort. I live on the Texas Gulf Coast and in the summer it is too warm for me. I added a quilt for summer (not needed in our mild winters) and just fold the comfort down. The reverse print is too country for me but I love the bold colors and print on the "front" side. I love this comforter, it's big and full but not too heavy, the colors are true to the picture. Very happy with this purchase! This was a Christmas Gift for my Grand niece 7 years old, too grown up for her, I do recommend them 10 STARS. Had to return them, sad. The product arrived on time and in good condition. Overall quality is good. I like the size, because it fits reasonably well on my new queen size bed, which has a rather tall mattress. Colors are fairly true to the online illustration. Great comforter! Colors are bright and cheerful which is what I wanted. I love this comforter. it is really comfortable but the colors are much brighter than pictured. Beautiful Echo Set. The colors are exactly as pictured. We order all the pillows with the exception of the lime green. Set looks beautiful on our new bedroom set which has a high headboard with cushion back and detailed footboard. I’ve ordered numerous oth item from overstock. This was my first purchase and I’m very please with the quality and time of delivery. Just as pictured. Soft, bright and looks great! "Are any decorative pillows included in the set?" "Does the king size comforter hang down both sides of the bed? The one I currently have (not this style) comes just to the edges and we fight over it all night." "What's the drop on the bedskirt for a queen bed?" "If I purchase the euro sham separately, do they come "one" per unit or "two". Thank you." The sham is sold as a single. "How can I purchase the oblong green pillow shown in the picture?" Hello beledi, unfortunately, the green oblong pillow is not offered in our inventory. Please let us know if you have additional questions. Thanks for shopping with us. "How many shams come in the eruo sham purchase?" Hello apnarang89, there is only one sham per order. Thank you for shopping with us. "Is this comforter too heavy or warm for Spring?" Hello Briana, we can appreciate the fact you want a firsthand account of the product. You will receive an email notification every time you get a response. Thank you for shopping with us.